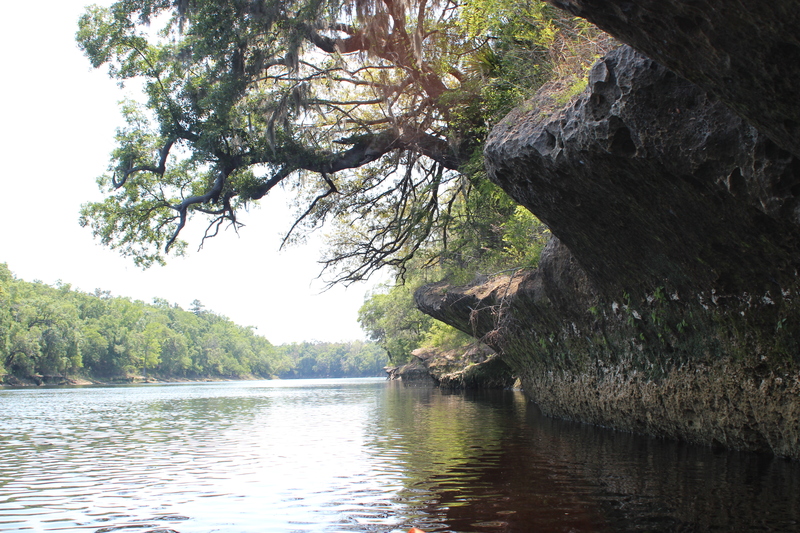 It felt so good to have ‘traveller’ strapped to the roof of my truck that I smiled the entire ride to the river, just thinking about another Spring paddle down the Suwannee River made me grin. 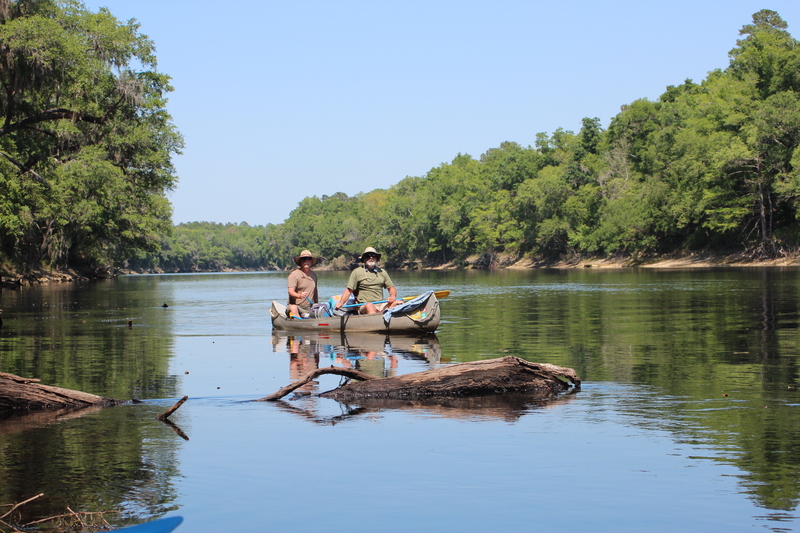 This years trip included Gordy (determined to complete the length) along with Carl (from the Mississippi) and his brother Richard. 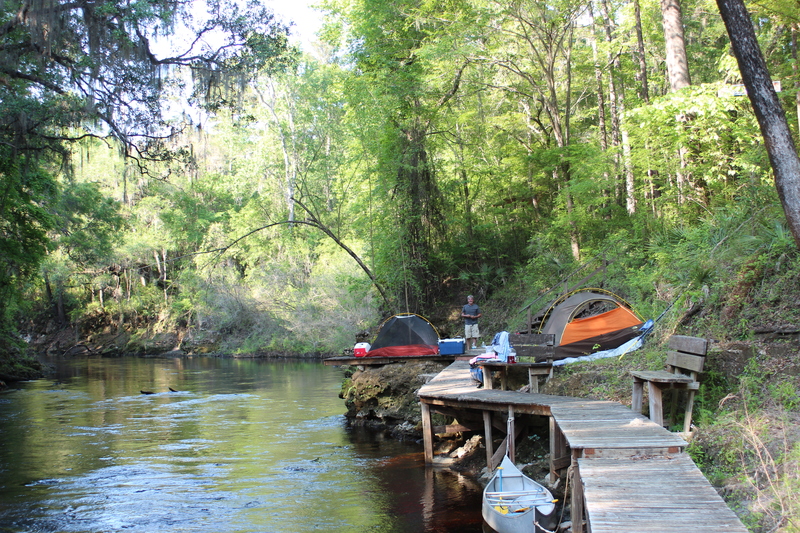 The 8-day 2012 trip ended up with perfect weather over 150 miles from the Suwannee River Outpost (near Live Oak) to the Gulf town of Suwannee. 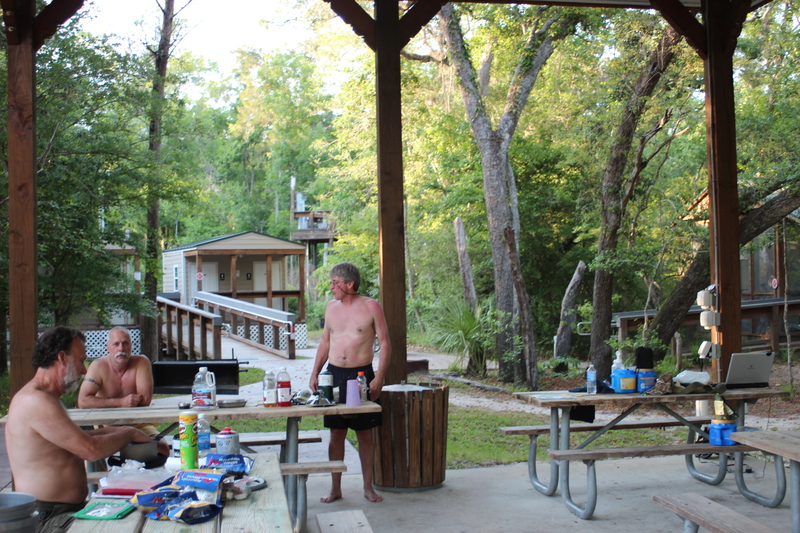 We met at a motel that was proximate to the river near Live Oak on Sunday. 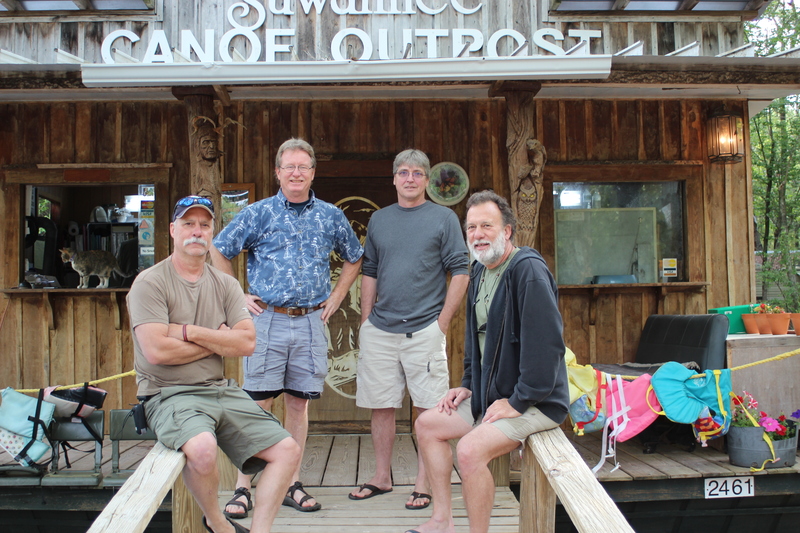 First thing Monday we headed over to the Suwanee River Music Park; this is where the ramp and Outfitter were located. 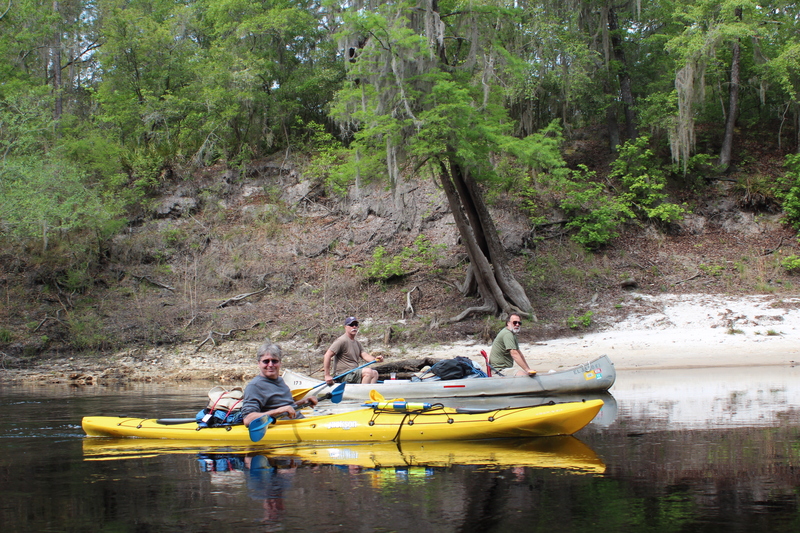 The shuttle from the outfitters would return us from the Gulf in a week or so, $41 bucks each – well worth it. 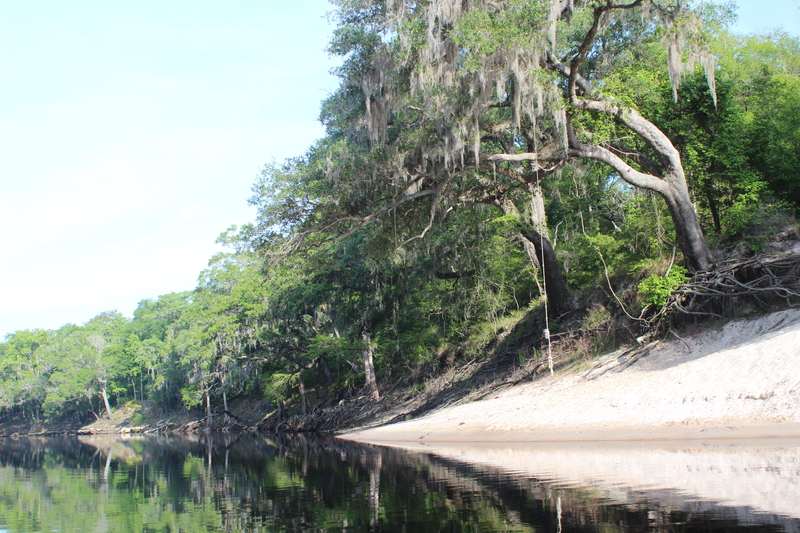 After this settled it didn’t take long to have our vessels down the ramp and sitting atop the Suwannee’s mellow current – downriver. 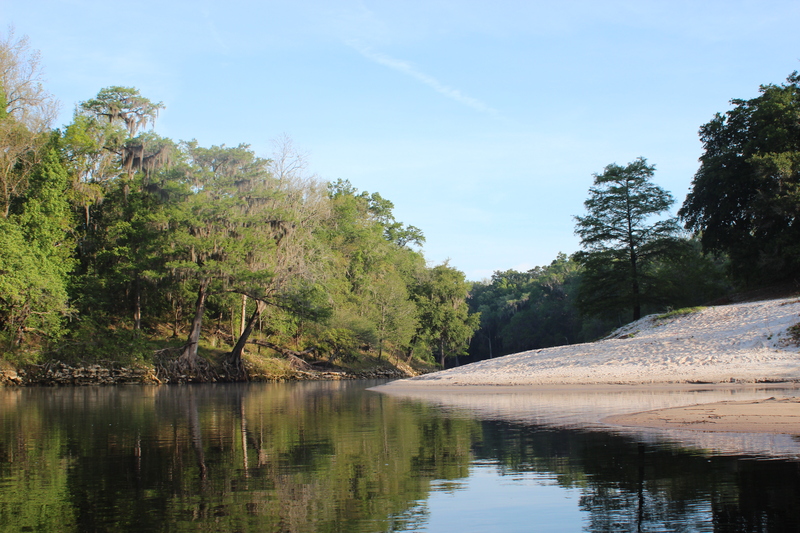 All reports had been with low water, on this date the water gauge at White Springs was at 52-feet, this reading is a good measure of volume for the river and a common gauge used for paddling the Suwannee – anything below 52 means a smaller creek Northward with potential sand/shoals on the lower. The water marks along the shore indicated that the water was lower than normal – but it was hard to sense as we had a solid current every day – if there was a difference with the volume/current, it was hardly noticed.. 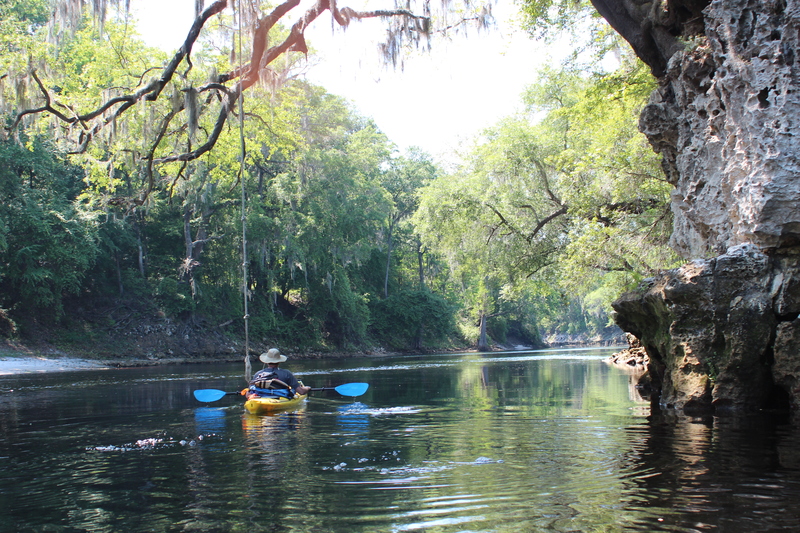 The character along the Holton Creek corridor is one of the more striking sections along the Suwannee, the shorelines and tree roots leave alot to imagine and ponder as you ease along around 3 mph. Neat things to look at. 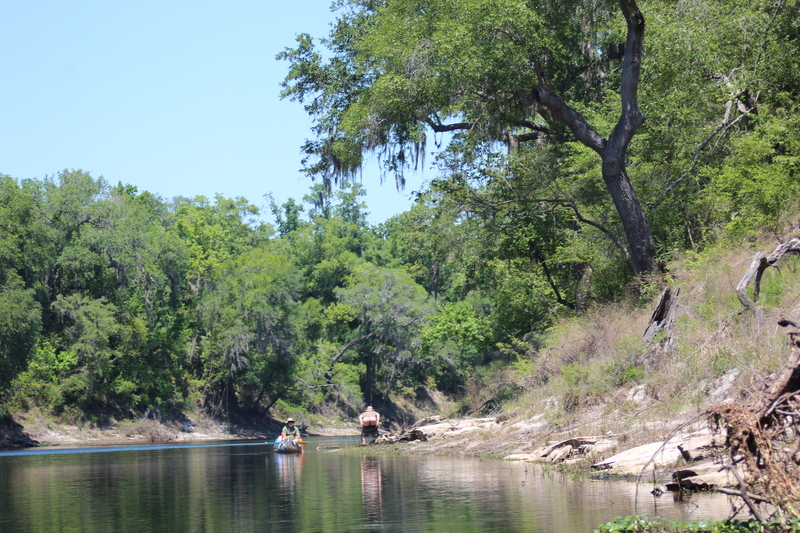 With a potential 29 mile paddle the second day, our first day of paddle was planned as a very casual ‘shake-down’ kinda day, orienting with each other, our vessels, and the river. 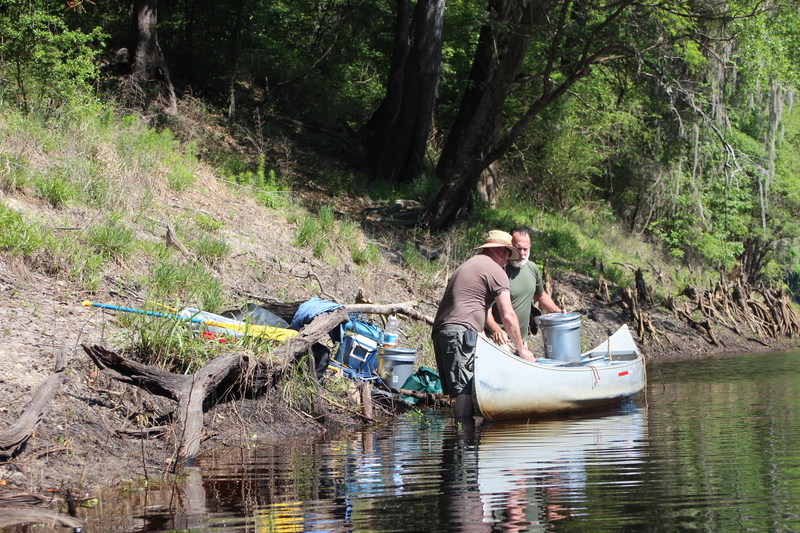 Carl and Richard were new with the canoe and had it fully-stocked, seemed like ice was going to be a priority on this trip. With that said, some of us may have started a bit early with the red-drink (waggitt/adder) concoctions – but hey, it was a ‘shake-down’ relaxed day. Arriving early at the Holton Creek River Camp we walked the camp, laid around like a bunch of cows in the shade – then decided to push-on to reduce the anticipated mileage of the following day. 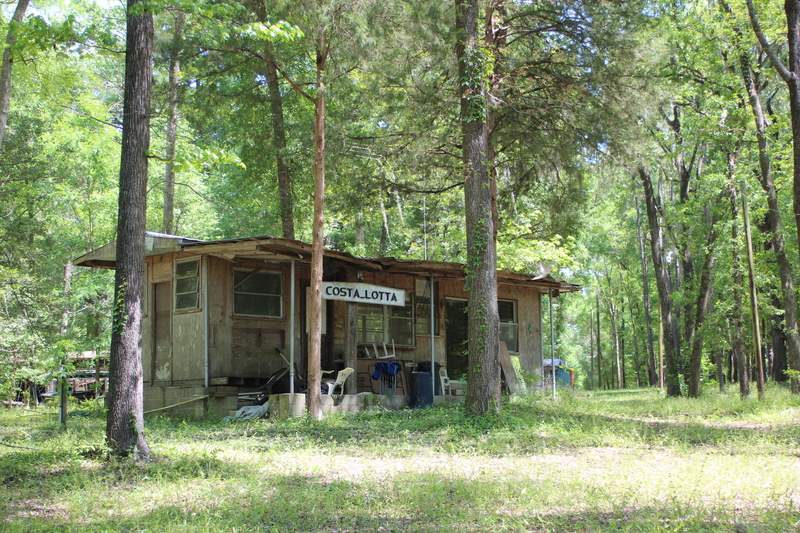 In moving on I did have a place in mind, one that was noticed on the Holton Creek visit, “Shelley Run” – just before Gibson Park. 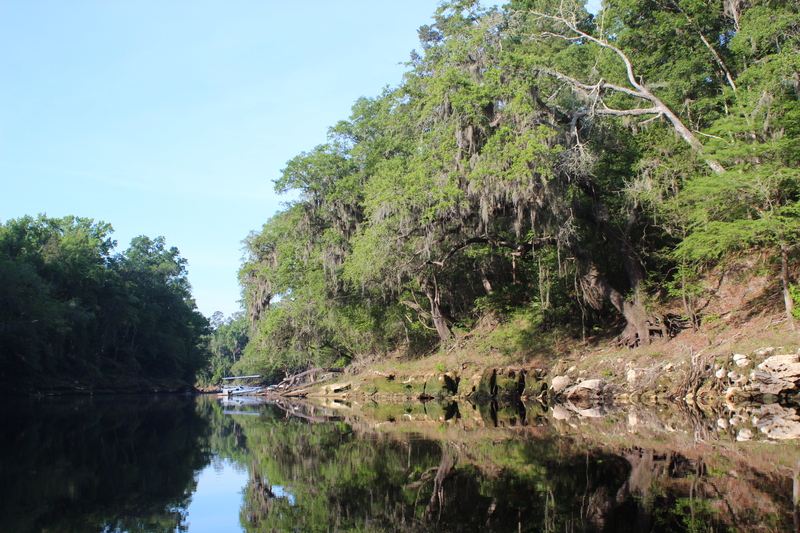 Originally I thought it was a ‘spring,’ but the water wasn’t truly clear enough for spring water, later I heard that it was an underground branch of the Alapaha river – the Alapaha rise. I’m not sure but it is a ‘boil’ which starts just above the private docking. In the trees above there were the chime of owls hooting and ‘courting’ each other – sleep came easy.. Seems true paddler goes down with the sun, and rises with the morning light, and leaves only footprints..
Up, hot coffee and on the water before 830 – a full day to paddle and ponder ahead. 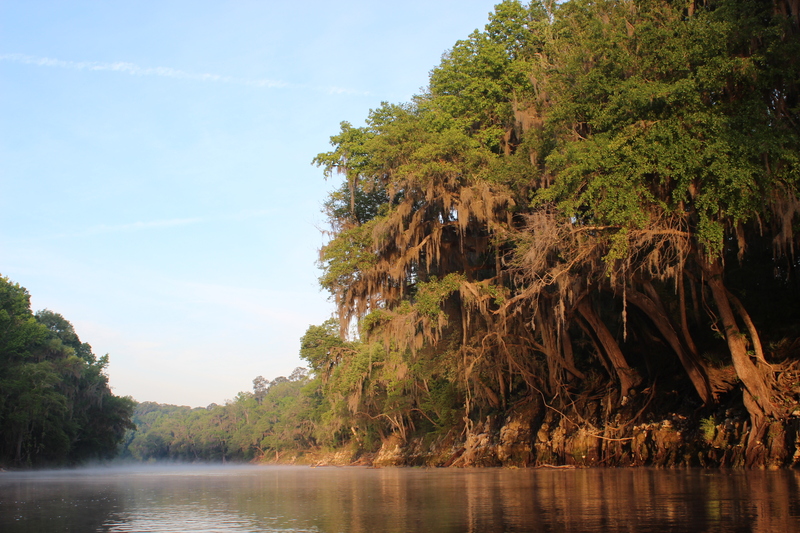 It’s kind of magical slipping through the Suwannee’s morning vapor as it lingers into another losing battle against the warming rays of sunshine. It’s ghostly along the shoreline as day-light penetrates and the beams reflect upward throughout the trees. The air is comfortable, damp, and peaceful. and rope-swings hang motionless along the shore. It’s all as simple and fresh as it gets. 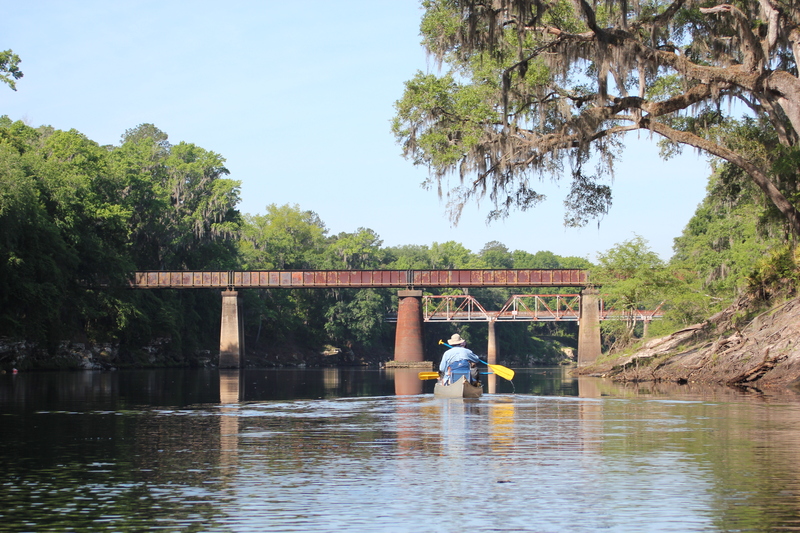 At the Suwanee River State Park the Withlacoochee River joins forces with the Suwannee, adding a little more current before passing under the railroad trestle. 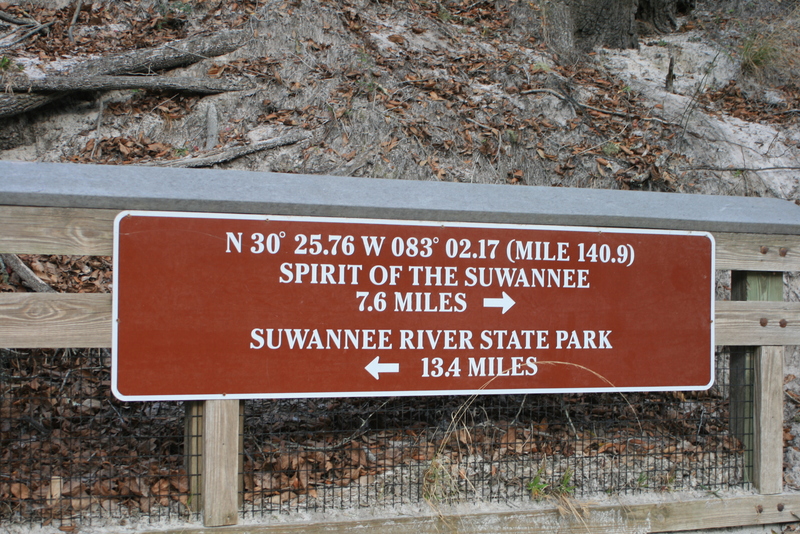 This bridge and area within the state park holds Civil War history..
INFO: Here, within the Suwannee River State Park there remains a Cemetery, Confederate Earth Works Fort, Ferry Landing, and Stage Coach Trail. – then the real entertainment began. 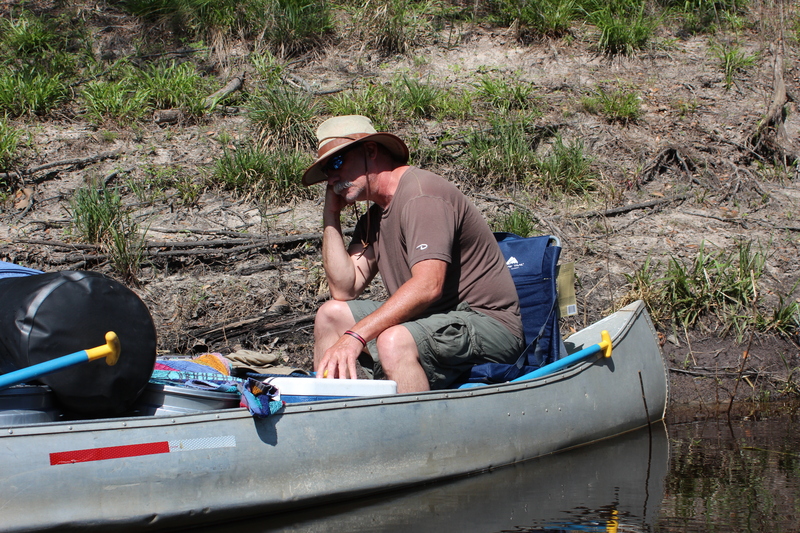 Whatever the reason the canoe had flipped and everything was in the water – with this being their first trip in this particular canoe – Gordy and I knew it would happen, it was only a matter of time (I won the $buck). Somewhere inside I think these two practicing an impromptu ‘half-of-a-roll’ began the process of adapting that had to occur before the final legs (and alligators) nearer the Gulf, the brothers refined their skills on this date. Later, after the second 180, there were no more. Gordy and I would have to adapt too. 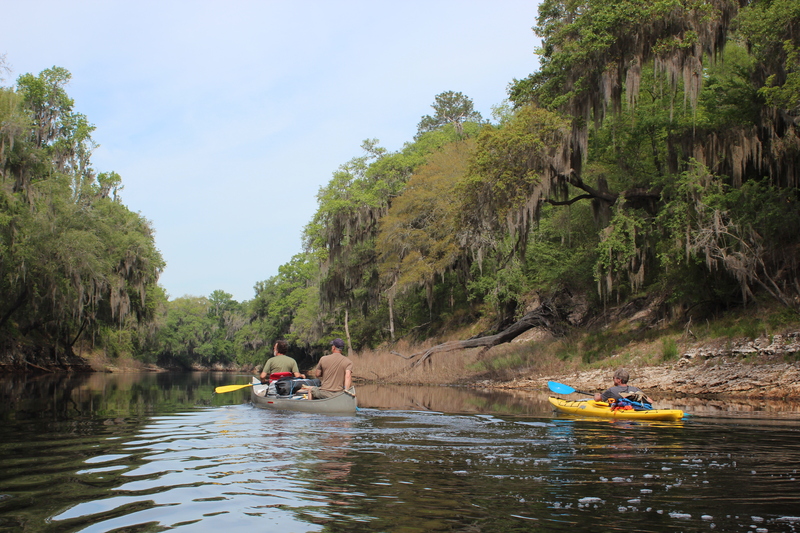 We were learning that where a canoe could carry a mess of ice, coolers, and ‘stuff,’ they were generally slower on the Suwannee’s gentle current. Where a kayak could make thirty miles in a day, from here on out it was a matter of working together as a group over twenty miles a day. This actually helped me to stop and enjoy things a little more. 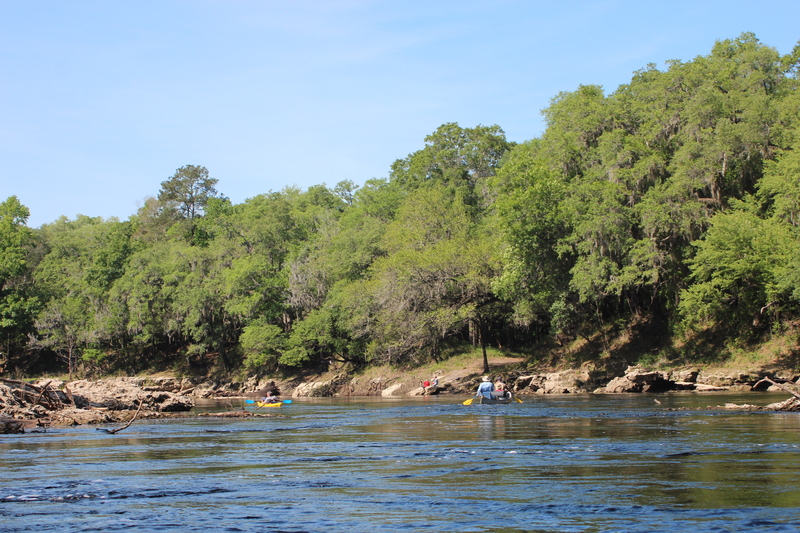 I remembered reading another trip-report about the river where it was advised NOT to hurry down the Suwannee, but to “take your time and enjoy.” Solid advice. There was now time to appreciate the layers of sediment along this section – which are identified as part of the crustacean period of 65 million years ago. There are fossils, certainly worth more than a glance. 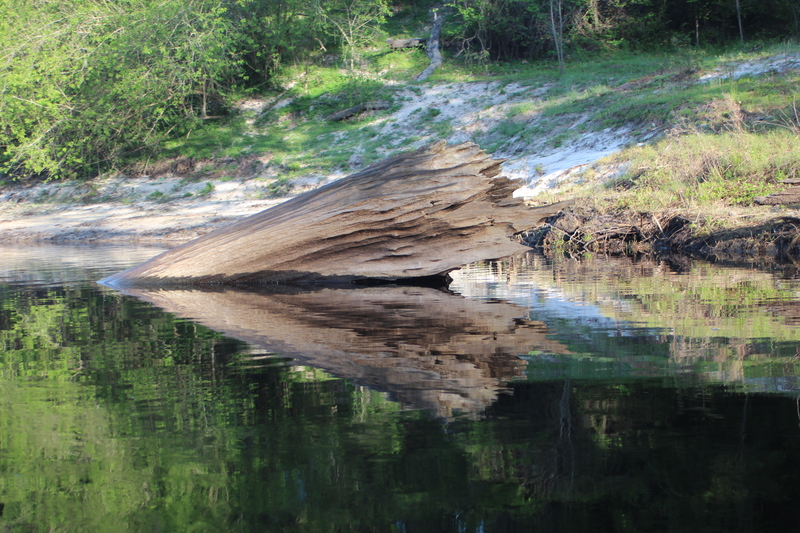 Some shoreline is steep and carved. – of course while we kayakers laughed and grinned at their antic’s – they replied with actions…. 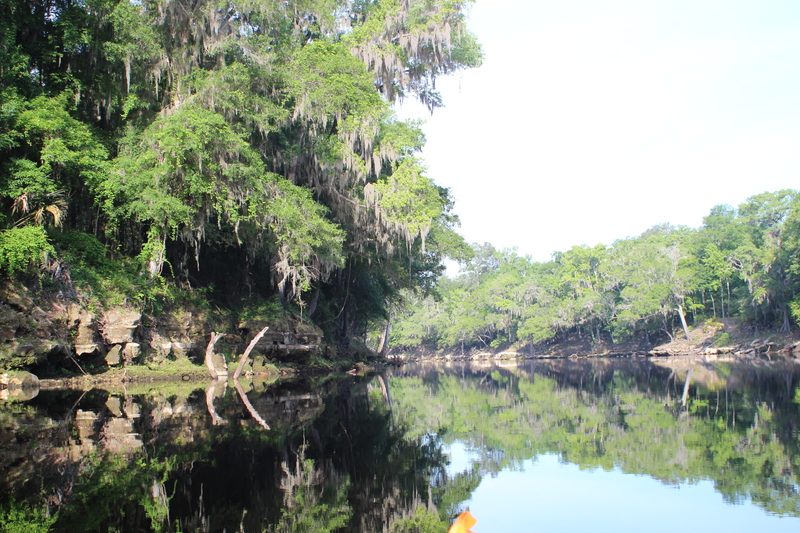 Along the Suwannee it can be anything that you want it to be. 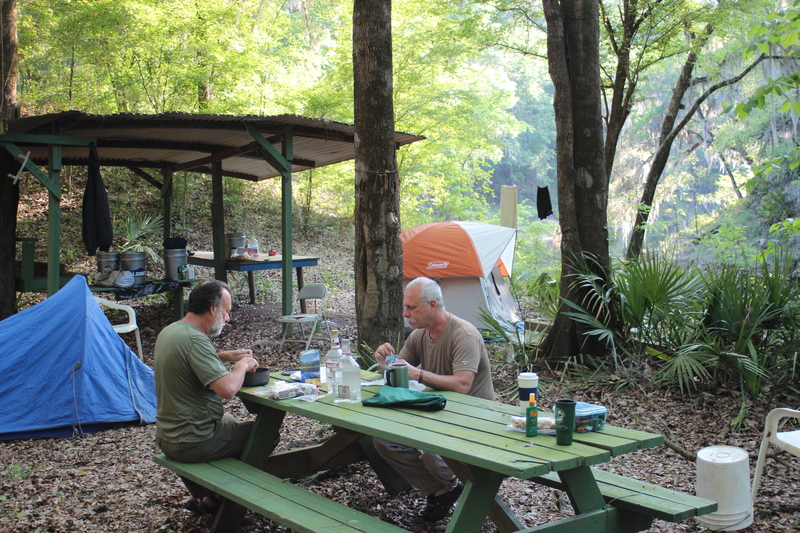 We made Dowling Park River Camp with host Chuck and Yoda the dog, great places to settle for a hot shower and a good nights rest. 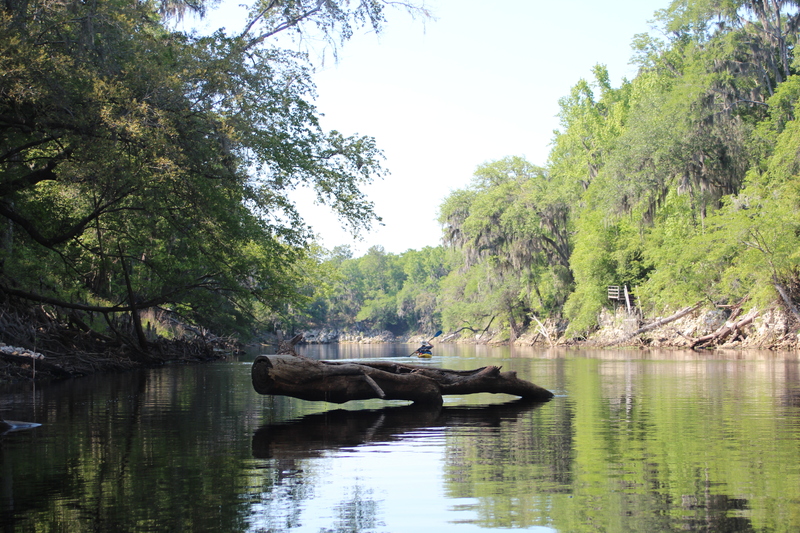 note: even though mentioned and shown on available maps – there are NO physical ‘river-mile’ indicators along the river. 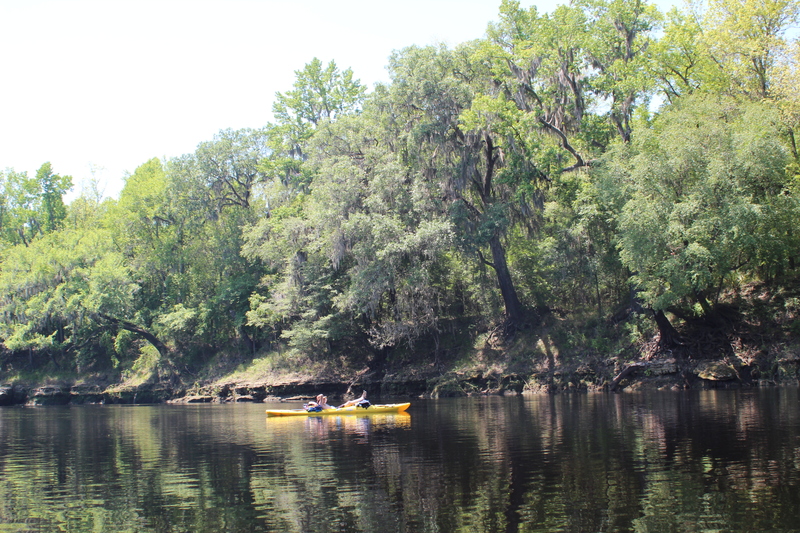 For further Suwannee River mileage information, check this link – Suwannee River Mileage, Trip Agenda ideas. 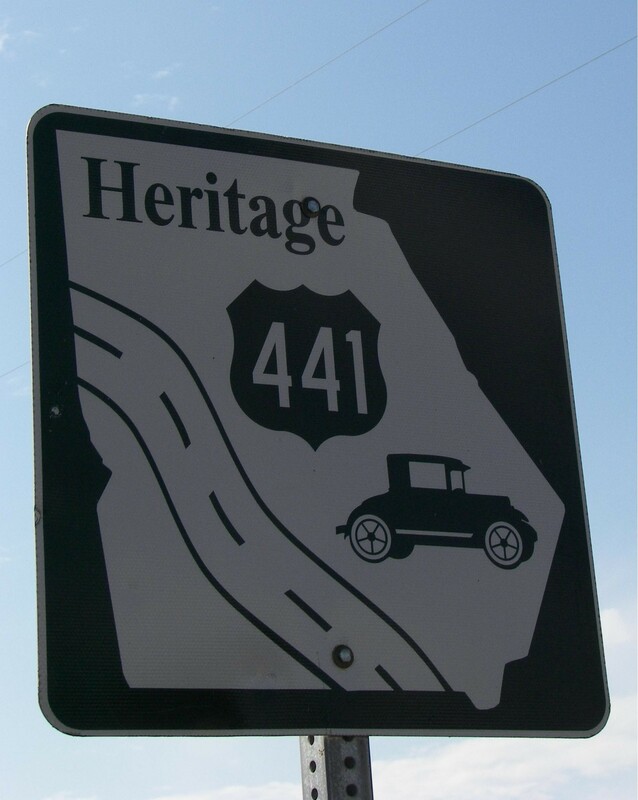 Opinion; Marking existing landmarks such as bridges, ramps, and river camps with a numerical reference would provide basic orientation points (and emergency references) along the river (the Mississippi has them). AS always “well done”. I love your writing. 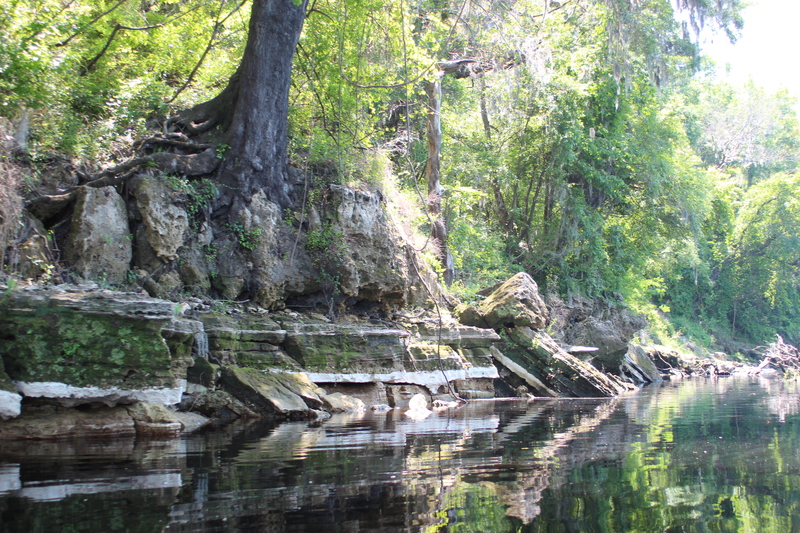 I’ve heard that the ‘boil’ at Shelley run is from an underground tributary of the Alapaha river – don’t know for sure – but the colored (not clear) water kinda gives it away… The reading at White Springs is 60 this week, hope it holds at 55 for a run next week – ‘go with the flow.’ Thanks for the note, happy paddlin..
I’m taking this trip (minus day 7 & 8) in mid April this year! 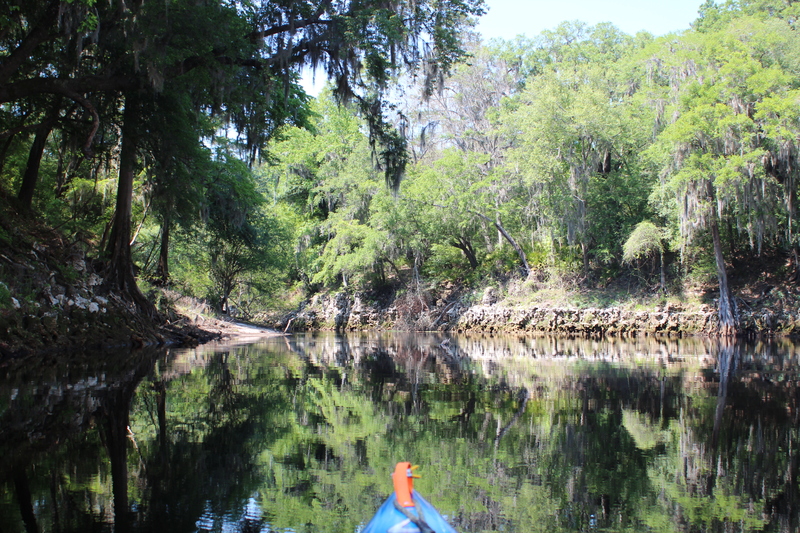 Reading your paddle trip has gotten me extremely excited!! While reading, I was wondering if Shelley Run is privately owned campsite? Do you need to RSVP it? 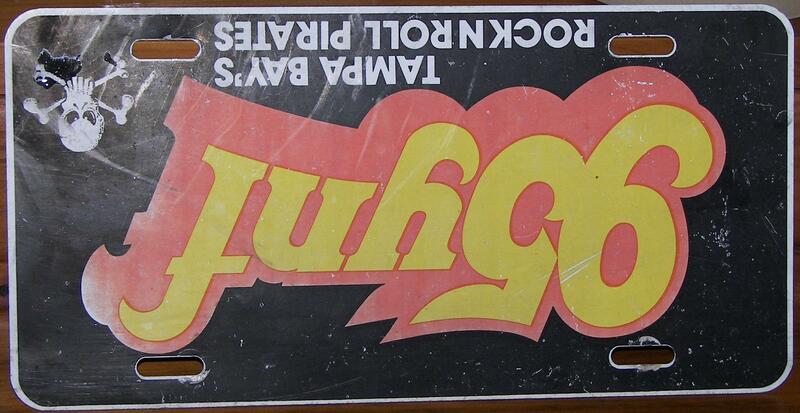 Thanks so much for making this paddle adventure available online. Really love your blog. 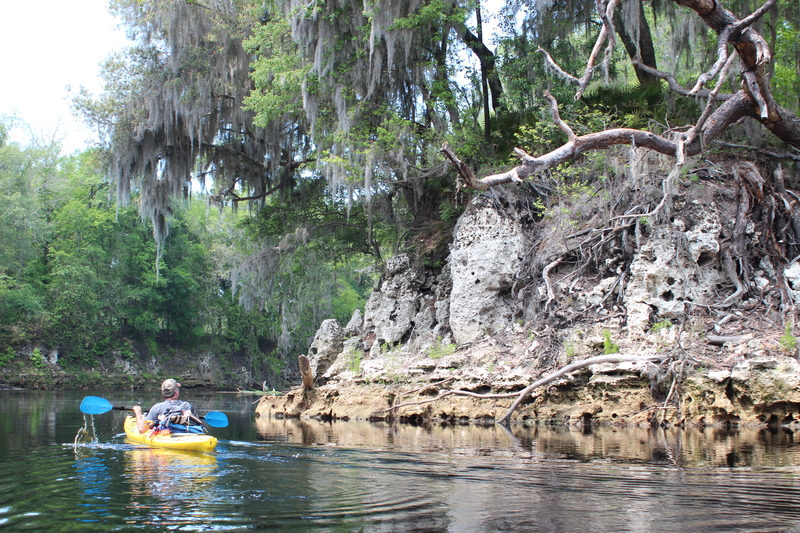 Paddling the Suwannee from Suwannee Springs to Branford in two weeks and this has been most informative. Great job. 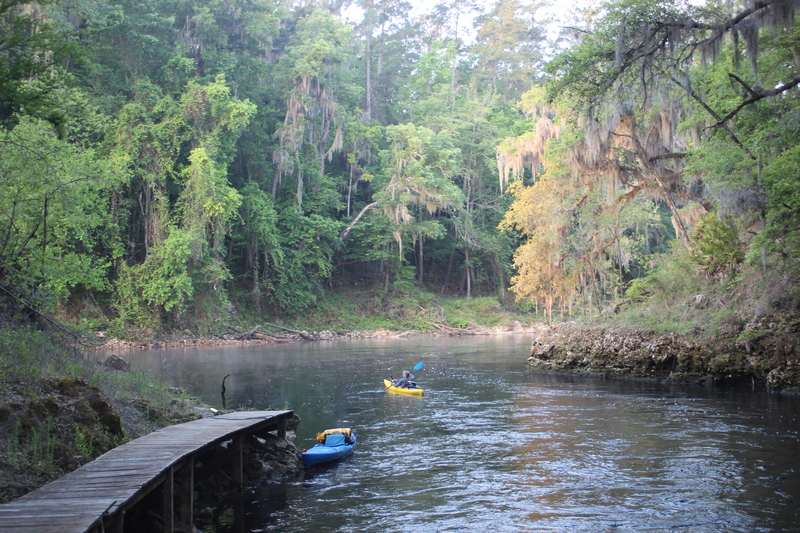 Thank you Chris, and have a great paddle…..